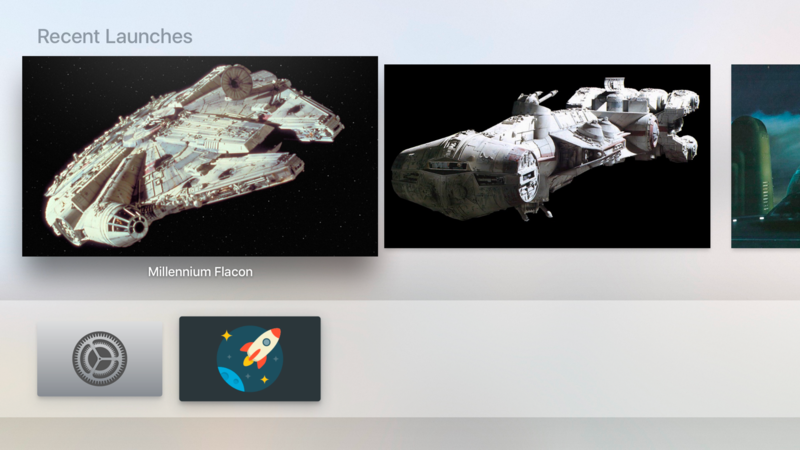 One of the best parts of tvOS is the Top Shelf. It's the bit just above the top row of apps on the home screen that shows previews of each app's content when it's focused (think "Trending Videos", "Recent Photos", etc.). We'll add a new target to our app. We'll create a new tvOS > Application Extension > TV Services Extension. Xcode will generate a ServiceProvider class for us that conforms to the TVTopShelfProvider protocol and provides TVContentItems back to the system. The .Inline style is neat too, but its purpose is only for displaying wide banners like the App Store app. We'll create a single section item, then set its topShelfItems to an array of items for the things we actually want to display. There's actually a lot of features packed into this little class: Simple things like separate deep-link URL for selecting, or pressing the Play button on an item, or more advanced functionality like the currentPosition property, which can help us display the user's "watch progress" on our top shelf items.